For those who loves coffee in all forms, Delonghi has developed BCO 330 T. With this device you will be able to brew espresso, cappuccino, and regular coffee simultaneously. It means that it will not be necessary to wait while one part of the device finishes brewing. Combi BCO 330t has two separate thermal blocks: the first one is for the regular coffee and the other is for espresso beverages. So, if you wait for a company of the guests ― the same coffee lovers as you are ― then it won’t be a problem to make up to 10 coffee cups in very short time. There is a con of this system: the filter should be replaced every 80 brewing cycles or every six months of coffee machine use. Programmable timer is a very handful thing when you want to brew your coffee at time, for example, in the morning by the time you wake up. The con is that timer works only while regular coffee brewing and doesn’t work with the espresso machine. Timer and clock set have a user-friendly interface that allows very quick and easy switch between the options and settings. So, you can set timer and clock, but mind that if the power failure occurs your settings won’t be stored in the memory of the device. The unique patented frother system ― so-called Swivel Jet frother ― will mix for your milk and steam. 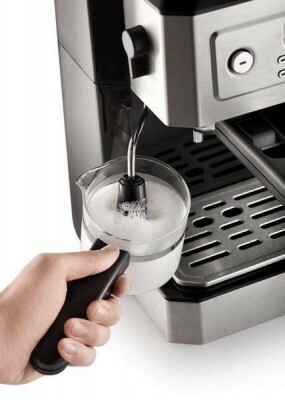 So you will be able to create your own cup of cappuccino or latte with rich and creamy foam. You can also use Swivel Jet to heat the milk while preparing the hot chocolate drinks. But before start frothing mind one very important thing: use only fresh milk. Milk should not be hot or boiled. Also you have to mind that while frothing volume of the liquid will double or even triple. That’s why you have to be cautious when you choose milk vessel: choose the larger one. BCO 330t, as we said above, is 3-in-1 coffee machine that will brew several coffee types for you. You can make regular drip coffee and different espresso beverages simultaneously in very short time. 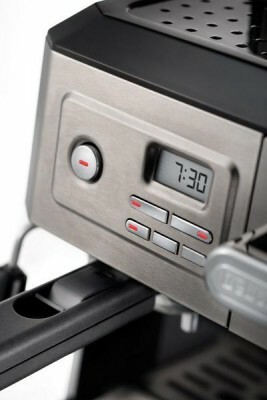 Drip coffee system has a programmable interface, so the device will brew it at any time you’ll set the timer. To make regular coffee you can use the classic paper filter and also great for drip coffee gold tone filter. You have only to put it I special filter holder. Several notes to mind! Before filling the water tank, pour the water into the carafe minding the quantity of cups you want to brew. Be sure that you haven’t overfilled the max level. Delonghi Combi BCO 330t is a device for home use, that’s why you can be a bit disappointed while preparing espresso beverages. Yes, it can make beautiful foam for milk drinks. But it also brews espresso with steam, and steam produces pressure not enough to get the right tasted espresso beverage. It is a fact that to make perfect barista-style espresso, coffee machine has to be able to produce at least 15 bars. of pressure. Steam produces less than 5 bars. That’s why coffee brewed with BCO 330t has the different consistency and as a matter of fact ― different less rich taste. So, if you are a lover of perfect espresso taste, it’s better to watch over Mr.Coffee coffee machine. BCO 330t is a perfect device for home use. It perfectly saves space in the kitchen, brews great drip coffee and fifty/fifty espresso beverages. Unique frother system helps to make espresso taste better but still, milk is not enough. Espresso is a lifestyle, so this device won’t fit the strict coffee lovers. It won’t give you coffeehouse beverages. I LOVE this great machine! I make 5-6 cup of coffee per day about 3 years all good!